The Vegas Golden Knights' debut on the Strip was a poignant smash. James Neal scored twice during a thrilling four-goal first period, and the Golden Knights remained unbeaten three games into their inaugural season with a 5-2 victory over the Arizona Coyotes in their home opener on Tuesday night. Tomas Nosek scored the first home goal in franchise history just 2:31 into the first period, and Deryk Engelland added his first goal for his adopted hometown's new team moments later. Marc-Andre Fleury made 31 saves for the Golden Knights, who became the first team in NHL history to begin their debut season with three straight wins. Just nine days after the Las Vegas Strip shooting massacre, the Golden Knights reverently honored the victims and heroes before the long-awaited home debut of the city's first major professional sports franchise. The Knights held a pregame ceremony during which the names of the shooting victims were projected in gold onto the ice during 58 seconds of silence. Engelland spoke eloquently to the fans, vowing that the Golden Knights "will do everything we can to help you and our city heal. We are Vegas Strong." After that emotional outpouring, the Golden Knights charged into their home opener with some inspired hockey. Nosek and Engelland connected in the opening minutes before Neal scored back-to-back goals in 4:27, giving him five goals in three games - and all three game-winning goals in team history. Vegas led 4-0 in less than 11 minutes, getting well on its way to a cathartic victory. Oscar Lindberg scored in the second period for the Golden Knights, who opened their inaugural season with back-to-back road victories before returning home. Tobias Rieder and Kevin Connauton scored for the Coyotes, who remained winless after losing back-to-back games to the expansion Golden Knights in a four-day stretch. The crowd had scarcely quieted from the pregame festivities when Nosek, the Czech wing who spent the past two seasons with Detroit, fired a shot through Antti Raanta. Engelland, the veteran defenseman who has lived in Las Vegas since playing here for a minor league team several years ago, then took a pass from Brendan Leipsic and fired it through traffic. Neal, who scored the first goal in franchise history, made it 3-0 just 6:15 into the first period and chased Raanta, who stopped only three shots. Neal added the first power-play goal in franchise history 4:27 later, setting off roars of excitement in T-Mobile Arena. Connauton's goal in the third period was his first in his 27 games for the Coyotes. The Golden Knights' opener was a bit more somber than the franchise originally planned, although the crowd was still whipped into a frenzy by its team's excellent play. 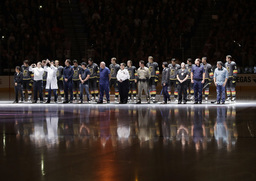 Before the game, the Golden Knights introduced their players alongside a member of the medical or law enforcement communities that responded to the massacre. NOTES: Coyotes forward Brendan Perlini left in the first period and didn't return due to an upper-body injury. ... Arizona's Mario Kempe made his NHL debut. The 29-year-old Swede spent the last three seasons in the KHL. He nearly made the Coyotes out of training camp, but briefly went to the AHL before replacing No. 3 overall pick Dylan Strome on the Coyotes' roster Monday. Kempe's younger brother, Adrian, plays for the Los Angeles Kings. ... Oakland Raiders owner Mark Davis attended the game. Coyotes: Host the Detroit Red Wings on Thursday. Golden Knights: Host the Red Wings on Friday.